8 Signs of Kindred Spirits - Have You Met a Kindred Spirit? 8 Signs of Kindred Spirits – Have You Met a Kindred Spirit? 8 Simple Signs to find out who your kindred spirits are! Everything in life is made up of energy. As people, we all resonate at various frequencies throughout the day and over the course of our lives. That experience we have when we automatically ‘click with’ someone is simply a matter of a vibrational match in energetic frequency. 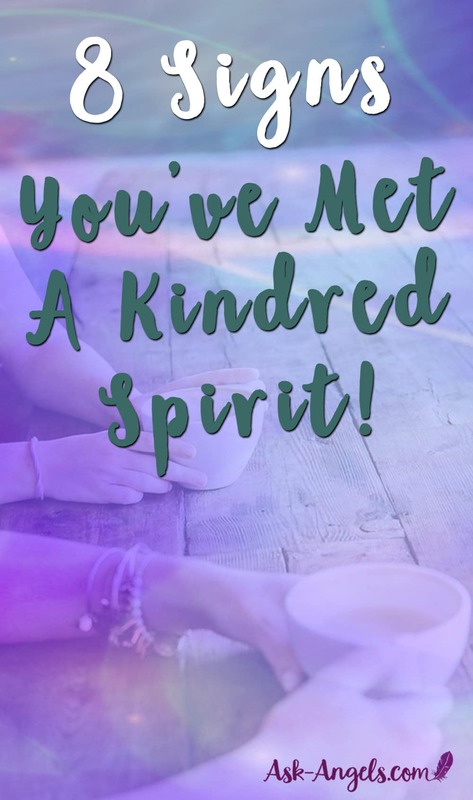 What is a Kindred Spirit? Kindred spirits are those people that resonate at our same vibrational frequency or energetic level. Kindred spirits can be found in many forms and in almost every type of relationship. They can be a close friend or confidant, a teacher or guide, a member of your family, a partner or lover, a geographic location, or a pet. There are many different levels of kindred spirits. They make take the form of soul family, they may quickly become an anam kara or life long soul friend, or a kindred soul may simply be someone who you connect with for an afternoon, enjoy a long conversation on an airplane, or briefly meet in passing, notice the energetic match, and then never meet again. What’s beautiful about kindred spirit relationships in every form, whether they become deep life long friends, or stay as short casual encounters is how much they can teach us about ourselves and our relationships with others. Kindred spirits have a way of highlighting our own gifts and potentials because they are our energetic matches. We enjoy the qualities, strengths and, energies in them, that we too carry within ourselves (consciously or unconsciously). Kindred spirits can help you to honor your unique light, love yourself more, and remember the simple beauty and power of connection with those like-minded and resonant souls. So how can you tell who your kindred spirits are? Honestly, your intuition will give you the biggest clue. It often comes in the form of an instantaneous knowing that you have just connected with someone special, someone resonant, or someone who is in some way a positive vibrational and energetic match for you. You are likely to share the same political views, religious beliefs, and/or ethics as your kindred spirit, they are after all an energetic and vibrational match with your energy. There is always room for difference though, so you shouldn’t expect to find your energetic double or clone, but do pay attention to those souls who you just naturally resonate and sync with. Being in the company of a kindred spirit is usually easy. You won’t often disagree with each other about the things that matter most to you, and while they may challenge you to step into more of your power and shine more of your light and truth it is usually in a supportive, uplifting way rather than the hugely dramatic and challenging shifts karmic relationships can bring. Respect is one thing, honesty is another. A kindred spirit will always be honest with you, even if it’s difficult (maybe even especially if it’s difficult). Like most relationships, kindred spirits aren’t going to show you only what is good in life, but what is true. Kindred spirits authentically and naturally connect with one another, these are the relationships where the masks come down and the truth is revealed. When you're with these people, you feel free to be the true you. You don't feel like you have to hide your light or dim your truth… It's like the best qualities you carry are more easily embodied. There is no end to what you can teach and learn from each other. It could be a new way of thinking, acting, or living. A kindred spirit can bring you a new perspective and greater objectivity. No matter how difficult the issue, kindred spirits have a tendency to be great mirrors for us. We learn by watching them with openness and compassion. Recognizing in them the qualities you appreciate and enjoy, the perspectives you resonate with and the shifts and opportunities you can take to learn, grow and evolve in your own life. That feeling that you’ve known someone for an entire lifetime, even when you’ve just met, is such an incredible feeling. This is one of the strongest signs of a kindred spirit. When you vibrate on the same frequency as someone, you will find so many other similarities between you. You’re at the same spiritual level and this impacts your everyday life. As you help each other raise your frequencies, a deep understanding develops, allowing for greater respect, honesty, and ability to learn from each other. There's an instant connection in some way or another, usually appearing in many ways, synchronicities and forms. Even though there will be some differences between you, as kindred spirits, you will always feel a sense of respect for the other. There is a natural trust and understanding between you where you're able to celebrate your similarities as well as differences, genuinely wanting success and wellbeing for each other. This sense of support leads to a wonderfully encouraging and supportive relationship. A kindred spirit is that person who calls you unexpectedly on the very same afternoon that you are struggling with something. Their intuition told them to call, and they did. If you say you are fine when you don’t mean it, they will know, will lovingly call you on it, and support you as your process what has happened. A kindred spirit has the knack of always asking the right questions at the right time. They are on hand with either the pint of cookie dough ice cream or a kick in the rear – whichever is most helpful in the moment. Can Your Pet be a Kindred Spirit? Life is funny sometimes and no more so when you realize that the divine has sent you a kindred spirit in the form of an animal. This is certainly a possibility and one that so many people experience in life. Although you are different species, with a kindred friendship between owner and pet there exists is an undeniable bond between you that can’t be broken. If you look back on ancient cultures you’ll find a great deal of reverence for animals. As humans, we have long known about the special connection between us – this has been the source of so much of our folklore, worship, and traditions have come from. A bond between an animal, understandably, can’t be expressed in words. It is both fulfilling and deeply spiritual. In so many ways that are nearly impossible to describe in words, the love, respect, and companionship with the kindred souls of animals can be so nurturing, supportive and profound. An incredible resonance can really be created between pets and their owners, both equally contributing their love, care, and energy to the connection. Not only friends and allies, with awareness, but pets can also be profoundly powerful spiritual teachers too… Teaching so many lessons of patience, loyalty, a connection beyond words, and of course, love. Have you Experienced This Kindred Connections? After reading this, you may be able to definitively identify current kindred spirits in your life. Whether or not you can, you’ll certainly be on the lookout for new ones as you move forward. Remember that the divine sends you what you need in the moments that you need it. Set an intention to be as open as possible to new people, talk to those from different backgrounds and walks of life. You’ll be surprised how many kindred spirits the universe is sending you. As you become aware and more in alignment with your authentic truth, it becomes easier to identify your kindred spirits. Coincidentally, being aware, and standing in alignment with your vibrational truth also allows you to be more aware of your connection to everyone and therefore you can act as a kindred spirit to all… Even those whom you don't particularly agree with or resonate with. With awareness, you can start to appreciate both the similarities and differences between yourself and the many souls who enter into your life. With awareness, every person, kindred or karmic becomes a powerful teacher. An opportunity to practice compassion and love and showing up fully in the moment as your true self regardless of whether you resonate with the person you're encountering, or not! With presence, awareness, and being true to you-you're then able to honor the life path of everyone you encounter and feel deep within that we are all important and valuable. But there is, of course, welcome magic and joy that comes in connecting with those beautiful souls in life whose energy vibrationally matches yours, this is the beauty of meeting a kindred spirit. I’ve experienced this with my ex.I just knew we have known each other before.I had friends who felt like that.And also complete strangers who I so just in that occasion where I needed to hear their helpful advice.It felt like they were angel sent.I’ve also experienced being of such help to other people.It’s amazing how we are all connected and can be of huge help to each other.